Sherlock Holmes Kickstarter Ending This Week! The Kickstarter for Sherlock Holmes in the Realms of Steampunk is ending in just a couple of days. I’m delighted to share that it’s been hugely successful, passing the second stretch goal over the weekend, but there’s still time to join us and pre-order your copy, as well as some of the other fantastic rewards that Belanger Books are offering to our backers. My story, ‘The Silver Swan’, will be opening the first part of the two-volume anthology. If the idea of classic!Holmes pitting his wits against mechanised swans in steampunk London intrigues you, then please check out my interview with Derrick Belanger, learn about the other fantastic stories and authors, and join the Kickstarter before it closes at this link. The Kickstarter is now available to reserve your copy of the new anthology from Belanger Books, Sherlock Holmes: Adventures in the Realms of Steampunk! Divided into two volumes – Tales of a Retro Future and Mechanical Men & Otherworldly Endeavours – the Kickstarter is open until March 21, 2019, and has already hit its funding target within hours of opening. My story, ‘The Silver Swan’, will be opening the first volume. 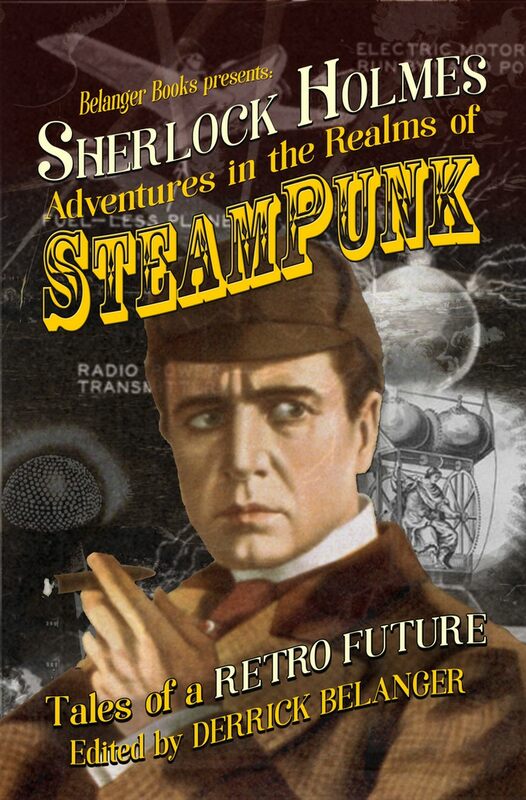 Tales of a Retro Future – Volume one of the anthology features stories with a focus on steampunk inventions. See airships cloud the skies, robotic swans attack, and apparatuses appear to raise the dead. Mechanical Men and Otherworldly Endeavours – Volume two of the anthology features stories with a focus on robotic creatures and otherworldly adventures. See Holmes team up with intelligent animals from an alternate Earth, switch bodies with Dr. Watson, and travel to another dimension. Take a look at the Kickstarter and see some of the great rewards on offer for our backers – and do let me know if you get yourself a copy of this brilliant anthology. I can’t wait to read all the stories myself! A deeply personal and dark story of mine was recently released in Issue 1 of The Society of Misfit Stories, from Bards and Sages Publishing. I love this story, even though I spilled out far more of my soul when writing it than I first realised. It’s twisted, unapologetically gritty, and I think I’m more than a little bit in love with the two central characters. Rules were made to be broken. Wings were not. Those incontrovertible truths had dictated Melusina’s life until now. Forever dancing the line between the two, she had managed to balance the demands of serving in the court of the Fae King with her insatiable fascination for the mortal realm. Until today. That was why Melusina found herself propping up the bar of a rundown Georgian tavern in the wrong side of London, knocking back neat bourbon like it was going out of fashion as the handful of Monday night patrons flocked around her, drawn in by the glamour she wore like a shield. If anyone was looking for her, they wouldn’t think to come here. In the paroxysm of her grief she gravitated towards the ramshackle pub, defiantly out of place amongst the modern buildings surrounding it. Like her, it was a relic from another world. The White Hart was the antithesis of the place she called home until today. Its brash vulgarity and shadowed corners should not have been able to draw her in, but for one thing. Nestled in amongst a whole host of talented authors, you can pick up the anthology for half-price until March 1st, 2019 with the coupon code XL39J at Smashwords. Let me know what you think! Happy New Year to you all! As we look ahead to 2019, it seems an apt time to fill you all in on my writing plans for the coming months. In terms of new work, my main focus is working on the edits for The Strange Case of Doctor Magorian so that I can begin looking for a home for it in the summer. If anyone knows any publishers looking for steampunk novels with a strong feminist backbone, please give me a nudge! The Death of Nostalgia will be featured in the February 2019 release from the Society of Misfit Stories. This was a story that took a dark and deeply personal twist when I was writing it, but coming in around 8000 words, I was aware that it was at that particularly awkward, in-between length that makes it a hard sell. Fortunately, it found a great home in next month’s release, and I can’t wait to see how the new format works for this issue. The Silver Swan will be featured in the Sherlock Holmes steampunk anthology from Belanger Books, with a Kickstarter campaign beginning in April 2019 prior to the anthology’s release. Whenever I think detective mysteries, it has to be Agatha Christie or Arthur Conan Doyle. I started out with Miss Marple, then graduated to Sherlock Holmes as I moved into my teenage years. The universal appeal of Holmes has withstood the test of time, and as much as I like the modern adaptations, it’s the classic stories which truly hold my heart. I couldn’t resist the urge to try my hand at writing in Doctor Watson’s voice (see earlier blog post) with a steampunk twist, and I’m overjoyed to be a part of this project. More to follow! Anamnesis will be in Moonlit Dreams, Moonlight Nightmares, to be published by Antimony and Elder Lace Press (date to be confirmed). I don’t want to give too much away about this one, but it was probably the darkest and most intimate story that I wrote last year. It really took on a life of its own, growing from an initial one sentence premise into a quietly tragic, horrific tale that stayed with me long after I wrote it. Finally, The Eyes Have It is to be part of the anthology Behind Eyes of Glass, from Fantasia Divinity (release date to be confirmed). This was one of those stories that grew from a pun of a title into something far less comical and darker than I expected it to be. In which I discuss NaNoWriMo, chronic illness and mental health. So I won NaNoWriMo this year; approximately 66000 words written during November. Sure, it’s an achievement, but proud though I am of the words I wrote and the stories I created, I’m paying the cost now. Under the pressure of trying to keep up with the word count, I used far too many of my spoons. 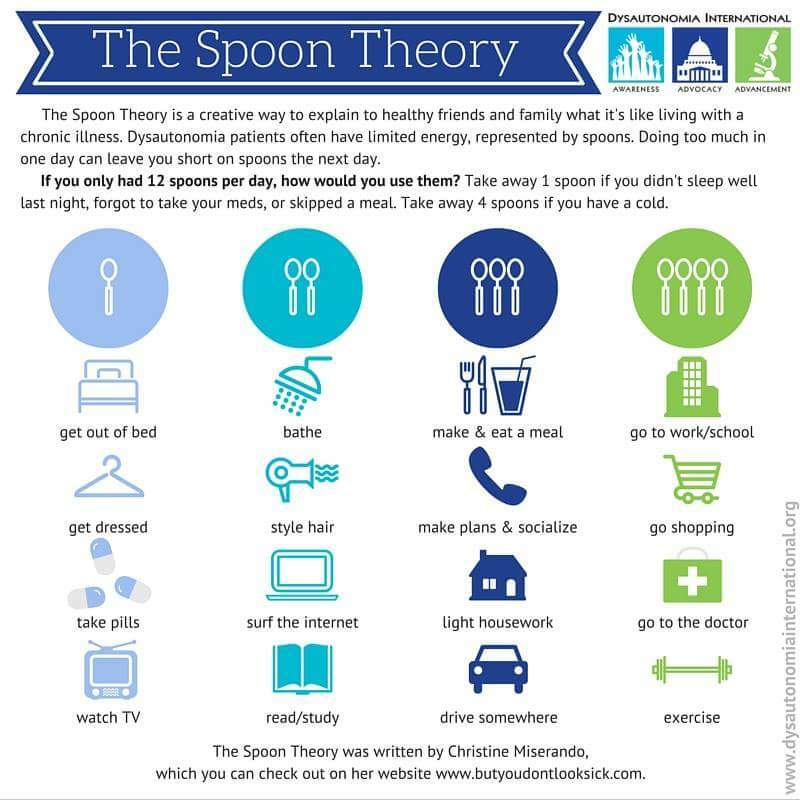 For those unaware of the metaphor, the spoon theory encapsulates the daily battle of weighing up tasks with the energy they cost and the pain they cause. When living with chronic illness (in my case, fibromyalgia), the spoons are limited and everything from getting out of bed to preparing food takes more of them away each day. The graphic to the left, courtesy of Dysautonomia International, breaks it down. As November went on and the word count went up, I realised that the number of spoons I started each day with was rapidly decreasing, but NaNoWriMo creates this strange kind of internalised pressure that means the fear of failure is too powerful to want to back down, especially when I knew that I’ve completed the challenge in numerous years with ease. Of course, back then I wasn’t living with fibro, but when my illness has taken so much from me, I was determined to prove (to myself, more than anyone else) that it couldn’t take this from me too. I tried to break it down and take some of the pressure away by not creating a single, stand-alone novel from scratch. Instead, I gave myself the target of exceeding 50000 words by finishing the first draft of The Strange Case of Doctor Magorian, and then writing as many separate short stories as necessary to get over the finishing line. I did it. A complete first draft is ready to be edited and I wrote four short stories too, one of which has already sold. At first glance, a success. Yet I haven’t been able to write since the end of November. I’m writing this now from my bed, curled up with my laptop whilst I wait for the codeine to kick in and bring relief for an hour or so. I have an appointment with my doctor on Thursday to discuss stronger painkillers, because the pain and exhaustion are so severe now that last night, my husband had to feed me. I couldn’t lift the spoon to my own lips. That’s why I won’t be doing NaNoWriMo next year. I’m burned out, both physically and mentally. This time of year isn’t particularly conducive to taking some time out, but I have no choice. Christmas preparations will have to wait, meet-ups and parties to catch up with patient, understanding friends one more hurdle that I can’t clear this year. I can’t cope with them, and I am well aware that my determination to push through my body’s warnings and finish NaNoWriMo is largely responsible for that. For now I’m just hoping that this flare-up settles in time for Christmas with my daughters. Next year, I’ll be cheering you all on from the sidelines and reading this post back to remind myself just why 50000 words aren’t always worth the cost. My story, ‘Broken Wings’, was recently published in Witches vs Wizards by Zombie Pirate Publishing. The ground rumbles ominously, the earth surging and shifting to the iron will of the powers of old. Lightning sparks the air with forked tongue, darting between two venerable channelers, ragged yet regal, each wrestling wicked tempests to do their bidding. Their magicks are diametrically opposed, their powers equally limitless, their intentions shrouded in mystery; theirs is a battle for the ages. This surely means death for any mere mortal looking on. This is the beginning of the end. This is WITCHES VS WIZARDS. Packed with magical tales of pure unadulterated fantasy, this collection of short stories features eighteen authors from all around the world. The Kindle and paperback versions are available to buy now from Amazon. 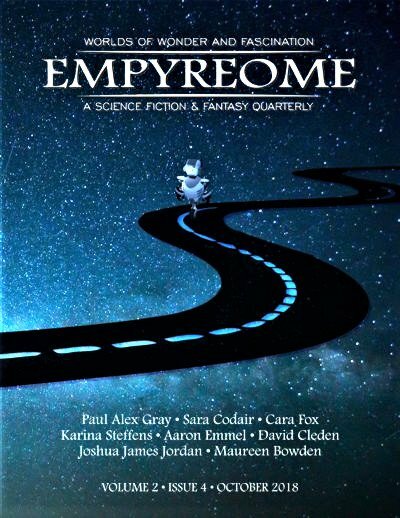 I’m delighted to announce that my little slice of Victorian feminist sci-fi, ‘Tabula Rasa’, found a home with the fine folks at Empyreome and was published this week in their October issue. You can find it free to read online at their website, and I would love to know what you think of it! This is a story that’s particularly close to my heart, and its characters have stayed with me long after I finished writing their tale. Story notes will follow next month, but for now, please do read it and the other stories in this issue. Empyreome have been a pleasure to work with from start to finish, and they definitely deserve your support and time. My health has taken a downwards turn recently, and now that my university course has resumed with the arrival of autumn, I’ve realised that I need to be more selective with the submission calls I want to write for, only giving my time and energy to those that truly catch my attention and are a pleasure to write. One of those that I’ve been working on this week is this submission call from Belanger Books, exploring the classic Sherlock Holmes characters in the realm of steampunk. As I dived into Arthur Conan Doyle’s world to get in the right mindset for my story, ‘The Silver Swan’, I could not help but remember my first forays into allowing other people to read my writing. Like many others, I suspect, I started out in fanfiction. As an unashamed Potterhead with a vivid and consuming imagination, I could not resist the compulsion to take JK Rowling’s wonderfully deep and detailed world and play around with her characters. The first novel I ever wrote aligned itself with the last three years of the series, clocking in at an immense 110k. That’s 110000 words I wouldn’t have had the confidence or inspiration to write were it not for fanfic. Fanfic often gets a bad rep, and I think it’s one that’s hugely undeserved. Oh, of course there are a lot of stories out there that could be described as raw and unpolished at best, but they are, nonetheless, the product of someone’s imagination, sparked by their love of the story and world that the original author created. If nothing else, fanfic can be a powerful writing exercise for writers who want to refine their craft. The real beauty of fanfic is that it allows the novice – or even more experienced – writer to take the rich tapestry at their fingertips and use that as a base to weave their own stories into it. As they do so, without even realising, their experiments with plot, dialogue and the individual voices of each character will start to strengthen their own stories in turn. Learning the nuances that authors like Rowling use to distinguish their style and narrative can be a tool to then use when they have the confidence to craft equally rich and detailed worlds of their own. And so we come back to Arthur Conan Doyle. I’ve been writing professionally for seven years. I am (mostly!) at ease with worldbuilding and relying upon my own ideas to spark a story with characters that are as real to me as if they are standing at my side, but something about this submission call and immersing myself in 221B Baker Street was impossible to resist. The story is coming along swimmingly, and even if I don’t manage to bring it in under the upper word limit or finish it on time, it has proved to be an enjoyable and much-needed exercise in first person narrative, something I tend to avoid as a rule in my own writing, but writing as Watson, a character I know intimately through Conan Doyle’s work, has liberated me to try my hand and experiment with the style. Authors must never be content to rest on their laurels. There are always lessons to be learned and ways in which we can refine our craft, and maybe by going back to the basics and using fanfic as a framework, we can do so without the added pressure of starting from scratch with the blank page staring at us balefully and the flashing cursor a potent reminder of a story that has to be pulled, line by unwilling line, from our heads onto the page. I’m delighted to share the news that another story of mine will be released next month. ‘Broken Wings’ will feature in the Witches vs. Wizards anthology from the great team at Zombie Pirate Publishing. My story features a witch with her back against the wall, forced to turn to lore of old in order to fulfil her fate. I’ll share the purchase links and official blurb when the anthology comes out in October. In other writing news, I’m completing edits on another short story that was conceived in rather less fortunate circumstances. My beloved godfather passed away, and I chose to write my way through the pain and draw on it as inspiration for a piece of dark psychological horror, tightly-knit with a close focus on the central character and her emotional response to the night’s events. It’s called ‘Anamnesis’ (and there’s a deliberate clue in the title, if you know the word), and I have a venue in mind for it. Hopefully I can send it off in the next couple of days, then it’s back to the Submission Grinder to perform yet more complex rejectomancy. I have a few more stories out at the moment which I’m feeling hopeful about, and of course, the obligatory submission to Artemis Rising at Pseudopod, my dream market. If you identify as female to any degree, I urge you to submit a story to Pseudopod or one of their sister podcasts before the end of this month. Don’t self-reject! I’m excited to share with you all that the charity anthology Dark Voices has been released by Lycan Valley Press! Originally titled Her Dark Voice Vol 2 and put together by Theresa Derwin at Quantum Corsets, the project moved to the team at LVP and is now available for you all to buy. Featuring my story, ‘Under The Skin’, amongst a whole host of hugely talented female authors, the paperback is now available to buy from Amazon US/UK, with the eBook version to follow. In other news, I was thrilled to sign a contract with Empyreome to publish my SF story ‘Tabula Rasa’ in their October 2018 issue. More to come on that soon, but suffice it to say that this story is particularly close to my heart, and I’m delighted that it’s found such a great home with Randy and the rest of the team at Empyreome.